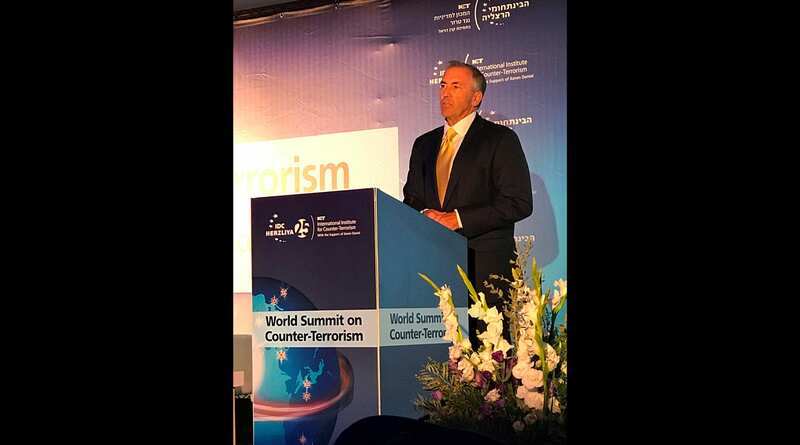 Herziliya, Israel – RedLand Strategies’ Michael Balboni was a keynote speaker at the 2018 International Institute for Counter-Terrorism’s (ICT) World Summit on Counter-Terrorism in Israel. For over a decade, ICT’s World Summit on Counter-Terrorism successfully provided a platform for leading experts and decision-makers to network, establish essential cooperation, and exchange views on best practices. This year an estimated 1,300 leaders from more than 60 countries attended the think tanks’ conference. Speakers and participants at this conference included current and former prime ministers, members of parliament, heads of security agencies and police departments, first responders, academics, top experts in the field of counter-terrorism, jurists, business professionals and students. Balboni spoke about cyber security and the weaponization of social media. He focused on four mega trends that will drive opportunity, touching on topics such as ubiquitous computing, data is the new oil, everything is cyber and cloud computing. He then spoke about four mega trends that will drive vulnerability: fake news, compromised Internet of Things, Industrial Controls Manipulation, and Low Cost / High Impact Attack Platforms. Balboni provided his expert insight and proposes possible solutions going forward. He further emphasized that the digital society poses many unrealized dangers, but that protecting critical infrastructure can be attained through the implementation of The Four G’s: Guards, Gates, Guns and Gadgets — the traditional concepts we apply to protecting the perimeter of a target — combined with The Four “D”s: Deter, Detect, Delay and Defeat —the desired outcomes of the successful application of the four “G’s”.